On February 9th, President Obama presented his final budget request for fiscal year 2017 to Congress, outlining his spending priorities for the coming year. As in years past, the president has chosen to make kids a priority and requested large investments for children to improve their physical, mental and economic well-being. 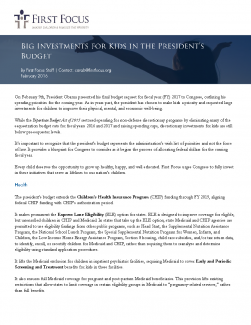 This fact sheet outlines the president’s requested investments in children including child health, early childhood, child poverty, housing and homelessness, education, nutrition, and child welfare. The president’s budget represents the administration’s wish list of priorities and not the force of law. It provides a blueprint for Congress to consider as it begins the process of allocating federal dollars for the coming fiscal year. Download our entire Children in the President’s budget series.